It seems impossible, but 2018 is quickly winding down. For me, it’ll seem even more extreme as I’m traveling in December, which means these last couple weeks of November are almost the last ones I’ll spend at home this year. 2018 hasn’t been the best year for me, to be honest. While there were a lot of ups, there were also many downs. It’s because of those low points though that writing this post is so very important. No matter what happens, it’s vital that I remember how lucky and blessed I am. Many of these moments and experiences are travel related, but not all. While travel is important to me, there’s much more to my life that I want to share with you all today. For years this was top of my bucket list and I am still on Cloud Nine after having had the chance to drive across the country on the Mother Road. It hearkens back to an era when anything seemed possible, when taking to the open road was an adventure and the fun truly was in the getting there. While Route 66 technically doesn’t exist anymore, it’s still possible of course to drive huge parts of it as you meander from Chicago to the pier in Santa Monica, California. Along the way are quirky roadside attractions, strange motels and national wonders that rank amongst the top in the world. Yes, I wanted to see and experience all of those things but I also wanted to reconnect with my own country, one I love dearly and of which I am fiercely proud. Just as people did in the 1950s and 60s, I wanted to experience a great American road trip and to discover aspects to the American experience that I never knew existed. Although I’ve traveled to some fairly dodgy places around the world, for some reason the idea of traveling to India deeply intimidated me. Looking back at it now, I feel silly but at the time my concerns felt very real. Listening to stories from friends and family, traveling around India sounded daunting and I wasn’t sure if I was even up to such a trip. It wasn’t from a lack of desire, quite the opposite actually. I’d long ached to see not only the country’s famous landmarks, but I also wanted to experience its colorful culture and delicious cuisine. Long ago though I made a vow, that if I ever traveled to India, at least my first visit would be with a company that I trust and which I knew would provide me with a luxury experience. So when travel experts Abercrombie & Kent and I started talking about new projects, I knew immediately what would work best. My luxury trip to India with Abercrombie & Kent was my third adventure with them, so I knew exactly what to expect. While the trips have varied from Tanzania to Spain and now India, I knew that no matter what, I would be in very capable hands and that they would take incredible care of me from start to finish. That proved to be the case and, much to my surprise, I found myself falling for India. I didn’t think I would have a bad time per se, but I never expected to enjoy it as much as I did and I know it’s a country that I’ll visit again. I live in a bubble within a bubble and it’s been something I’ve been giving a lot of thought to lately. I’m definitely one of those much reviled East Coast elites; over-educated, comfortable financially and I tend to love anything pumpkin spice flavored. Even within that bubble though, I live in a much smaller bubble – that of professional traveler. It’s a strange world that I’ve created over the years, but it’s one I love dearly. If you’ve followed this site over time, then you’ve watched as I made the at-times uncomfortable transition from a 9-5 professional, to whatever it is I do today. I made the difficult leap of faith from a job with a salary, benefits and stability to one that has none of those things. In the years that have elapsed though, I’ve become a better person in every possible way and today, in 2018, I couldn’t imagine living life in any other way than I do now. I also recognize though that it’s a luxury to be able to follow one’s dreams and passions. While I work extremely hard and do everything I can in order to earn money and to provide, I know it’s a job that not many people have, although they would like to. So I am thankful for the ability to follow those dreams I’ve had since I was a little kid and to be able to turn a lifetime of passion into a new profession. For a variety of reasons, I tend to visit Germany at least once or twice a year and it is a country I always love to explore. On my most recent visit, I focused on regional food specialties and quickly grew to love already familiar-to-me cities even more. One of my favorite experiences though was in Stuttgart where I learned all about Swabian cuisine. Located in southwestern Germany, Swabia is no longer a distinct political unit, but instead is a cultural region. Its roots go back for centuries and even though the area is now divided between two different states, the people who call it home absolutely identify first with being Swabian. Stuttgart is one of the best places to experience Swabia, but you can also find elements of the culture throughout southwestern Germany including Freiburg and even Augsburg. Traveling in Germany always means great food experiences, but in Swabia I think it’s a little extra special thanks to dishes and snacks like maultashen, spatzle, zwiebelrostbraten and of course the region’s amazing wines. This year marked my first Disney theme park experience and it has since become a bit of an obsession. 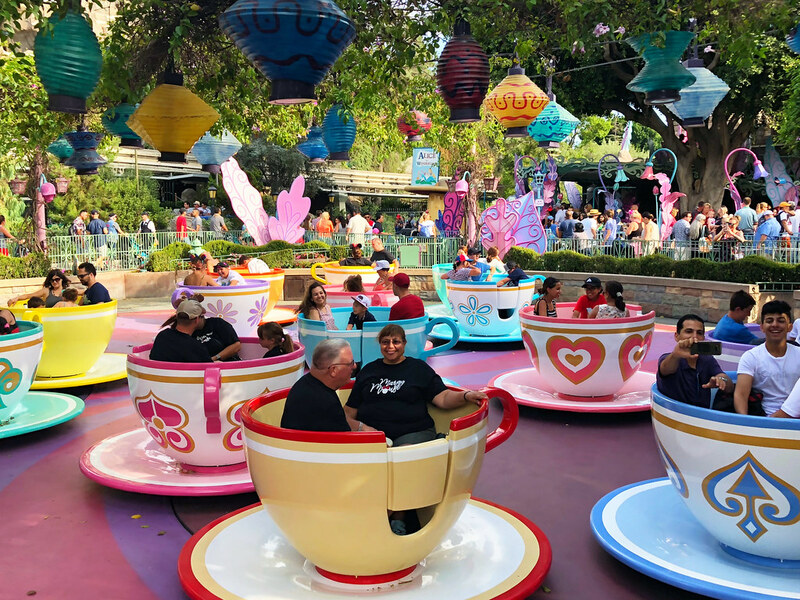 As I left Disney California Adventure park for the last time and started the short walk back to my hotel, I tried to decide why I had as much fun as I did over the course of two half-days wedged in-between work obligations. The rides were fun, no doubt there. Whether it was the vintage 1955-era attractions, or newer experiences, there wasn’t a ride that failed to put a smile on my face. But Disneyland is about so much more than just rides. Walking down Main Street, I forgot for a brief moment that I was in a theme park and that’s when it dawned on me. There really is magic in the Disney experience and that is what had made me so happy while I was visiting the parks. Everything about both parks is done expertly and it forces guests to believe in the illusion. It’s a remarkable ability and I honestly felt like a kid again. It was a wonderful feeling and one I know I’ll try to recapture whenever I can. I’m 42 (43 in a few months), my back hurts and I have arthritis in my knees. And yet, for the most part, I’m healthy and that means a lot. Over the last few years I have unexpectedly lost almost every member of my family, emphasizing to me yet again not only the importance of being healthy, but of doing what makes us happy in life. Our time on the planet is short and can end at any time, so if we’re not happy then what’s the point? If we want to change our lives or if we want something more in our lives, we have to act on that today, because tomorrow is frankly far too late. Go, plan that trip you’ve always wanted to take and don’t look back. Life isn’t about the past, it’s about continuously moving forward. Visiting Alaska was high on my travel to-do list for a very long time, and I knew that a cruise would be one of the best ways to first experience the 49th state. Its size and challenging transportation options make seeing it from the water a smart choice. Ultimately though, I wasn’t prepared for what the reality of sailing in the waters of Alaska is really like. It’s far from being a run of the mill cruise. No, in fact it reminded me much more of those expedition style experiences I’ve enjoyed in remote parts of the planet. The ports were great, but what really impressed me was the time spent sailing. Different from most other cruises, every second onboard the Holland America ship Westerdam featured incredible views and stunning scenery. Unlike the Caribbean or the Mediterranean where it’s common to lose sight of land for long spans of time, throughout the sailing adventure in Alaska, getting there was as incredible as the featured stops. Once we did arrive in port, we were met by even more opportunities to get out and explore the wild expanses of the state. Whether it was taking an old train through scenic mountain passes or soaring high above the trees on a floatplane adventure, the experiences shared the enormity and beauty of the state in stunning detail. I always have an incredible time exploring Ireland, but on my most recent visit I fell deeply in love with a small group of islands off the coast. I love small, remote places and the Aran Islands exemplify this affinity perfectly. The Aran Islands are a group of three islands located in Galway Bay on the west coast of Ireland. Largely isolated throughout the centuries, their remote location has defined culture on the islands even up to today. Early Christian monks sought out the islands for that very reason, finding a quiet place removed from the world where they could pray and worship in peace. Today the islands are famous for their adherence to not only traditional Irish culture and lifestyle, but also language and are just a lot of fun to explore. This is tricky to write because as the owner of senior dogs, it’s been a tough year. In February, I lost one of my best friends, my dear sweet Cody passed away after a thankfully short battle with cancer. I now have two senior dogs, one of which is also fighting cancer and my daily life is very much focused on taking care of them. While 2018 has produced far too many tears, I am so very thankful for everything my fur kids have given me over the last 16 years. Cody, and my two other pups, have given me so much more than I could have ever repaid. Not just in terms of pure happiness, but in helping me grow up into a proper adult and learn to appreciate life a little bit more. I was a shockingly young 28 years old when we adopted Cody, and not even I can believe how much has happened in those intervening years and how very much I have changed, nearly all for the better. Thank you Cody and I miss you every single day. Such a beautiful post! It has been a difficult year for many of us. I am thankful that I am free of a 25 year horrible marriage. I look forward to finding out who I am and the most wonderful part is that I can travel! I have so many places that I can’t wait to explore. I have family in South Africa, Canada, USA, Portugal, England, Ireland, Italy, Australia and New Zealand! Next year is going to be awesome (even if my knees have arthritis)!